Lee not only practiced his martial arts this way, he lived this way. What opportunities did he have? He arrived as a poor Chinese immigrant to the USA. He had no connections, no education, and no job waiting for him. He did not speak the language well and he faced prejudice and discrimination. But he attacked life. He worked hard. He was set back again and again, but he kept saying "Move on". He waited for his "slightest opening" and he set himself off like an explosive charge, taking America and the world by storm. More than 35 years after his untimely death we are still learning from the way he lived his life. How many of us want something but instead of focusing on our offense we focus on our defense? We are defensive; we are afraid of failure, rejection, looking foolish, being laughed at, so we don't go on the offense. We stay home and "defend ourselves", we defend ourselves from being hurt. But at what cost? The price we pay is we have no offense, we make no progress. We stay in the same old rut. All great success stories contain many great failures. Read about Conrad Hilton and most other of the famous rich men of America; all came close to bankruptcy, all experienced repeated failures. The mark of greatness is never giving up. We take a beating, we get knocked down, but we climb back up again. Like Bruce Lee writes, stop thinking about failure, focus your attention on the "most determined execution of your offensive." Wait for your "slightest opening" and charge forward. You have nothing to fear. 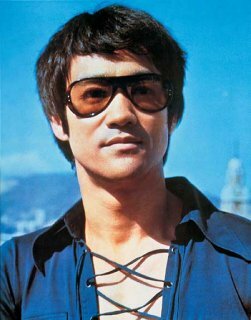 Bruce lived only 32 years but he did not fear death and he lived more in those few years than most people live in 80. Charge forward like a spring; claim your birth right, live to the fullest. Both in life and in a fight this holds true. In Krav Maga we burst forward with our offensive defense, we don't hold back, we don't stop until it is over. What do you fear? Getting hurt? By being defensive, by holding back, you will only get hurt worse! So wait for the slightest opening and seize that opportunity to burst forward, to charge forward. Don't wait, don't be too defensive. In a fight and in life, do not be the one who waits, be the one who initiates.